Like plants, adult sponges stay in one place. But unlike most plants, sponges take food into their bodies. They have been on Earth for about 540 million years. The body of a sponge is something like a bag that is pierced all over with pores. Sponges feed by straining food particles from water. A sponge gets its oxygen from water too. 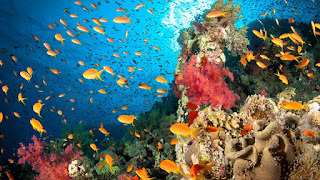 The water contains oxygen, which moves from the water into the sponge's cells in a process known as diffusion. The soft bodies of most sponges are supported by a network of spikes. 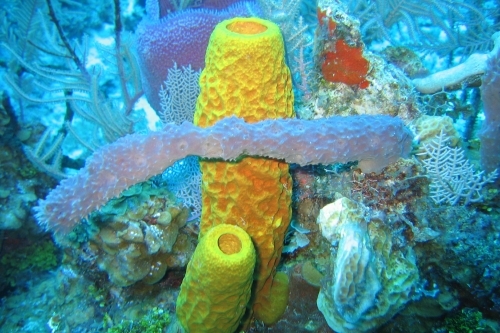 Sponges reproduce both asexually and sexually. In budding (one form of asexual reproduction), small new sponges grow from the sides of an adult sponge. Eventually these tiny sponges detach and begin life on their own. Sexual reproduction - sponges do not have separate sexes - a single sponge forms eggs at one time of the year and sperm at a different time. When a sponge produces sperm, the water currents that move through the sponge carry sperm from the sponge into the open water. The sperm may then enter the pores of another sponge and fertilize egg cells in that sponge. After fertilization, a larva develops. A sponge larva is a hollow ball of cells that swims through the water. Eventually the larva attaches to a surface and develops into a nonmoving adult sponge. Jellyfishes, sea anemones, and corals are cnidarians. Members of the phylum Cnidaria are carnivores that use their stinging cells to capture their prey and defend themselves. The stinging cells are located on the long, wavy tentacles. Cnidarians have specialized tissues. Movements are directed by nerve cells that are spread out like a spider web, or net. This nerve net helps the cnidarian respond quickly to danger or the presence of food. Cnidarians have two different body plans. Both plans haver radial symmetry. Polyp is shaped something like a vase, with the mouth opening at the top. Most polyps do not move around attached to an underwater surface. Bowl-shaped medus is adapted for a free-swimming life. Medusas, unlike polyps, have mouths that open downward. Some cnidarians go through both a polyp stage and medusa stage during their lives. Others are polyps or medusas for their whole lives. A cnidarian captures its prey by using its stinging cells to inject venom, then the cnidarian's tentacles pull the prey animal to its mouth. From there the food passes into a body cavity where it is digested. Understand food is expelled through the mouth. Cnidarians reproduce both asexually and sexually. Polyps, budding is the most common form of asexual reproduction. In some polyps the entire animal splits into pieces. Each piece then forms a new polyp. Some species of cnidarians have both sexes within one individual. In other, the sexes are in separate individuals. 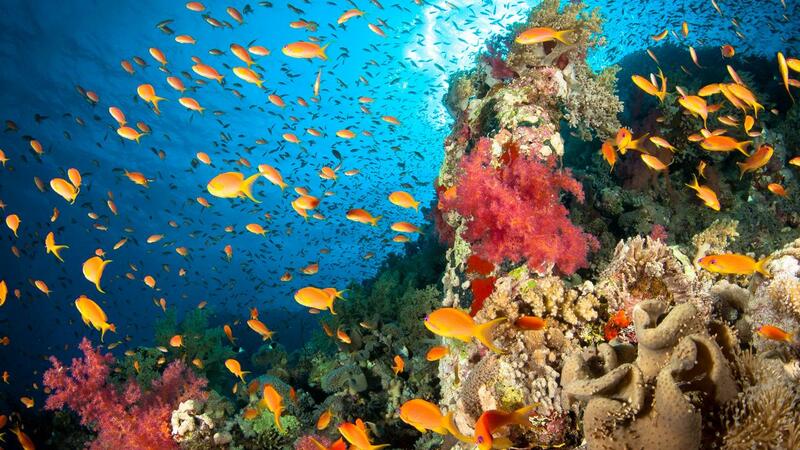 Coral reefs are built by cnidarians. At the beginning of its life, a free-swimming coral larva attaches to a solid surface. The coral polyp then produces a hard, stony skeleton around its soft body. The coral polyp reproduces asexually.